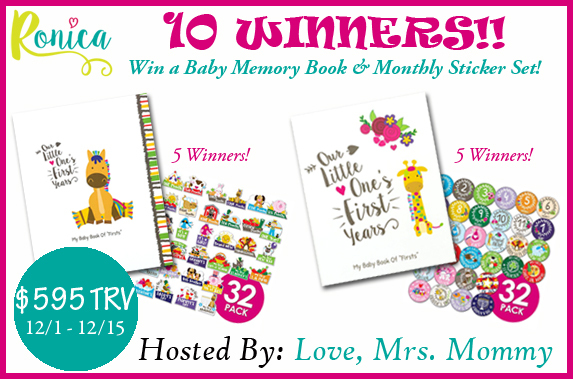 Love, Mrs. Mommy: Ronica Baby Memory Book & Sticker Set Bundle Giveaway! 10 Winners! $595 TRV!! Ronica Baby Memory Book & Sticker Set Bundle Giveaway! 10 Winners! $595 TRV!! Join us as we get ready for the 2016 holiday season with this fun giveaway hop. Each stop has a prize that is sure to please. At this bottom of this page you will find a clickable form with other blogs hosting their own giveaway. If you cannot see a form look for a small blue button which will provide you with the clickable list of blogs. Come back daily to increase your chances of winning! Good luck! 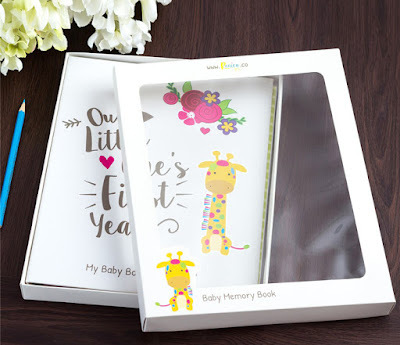 Click here to read Love, Mrs. Mommy's full Ronica review! I think my biggest challenge is having enough time for the children and also enough time for me. I have worked on this by making sure to take time out for myself so I can be a better person to the children.. It's takes some work to figure out a nice balance. Glad to hear you have succeeded! My biggest challenge was the need for perfection!! Once I realized that nobody and nothing is perfect about being a parent I was so much better off!! Oh, I hear ya! Cheers to that! Many well wishes for you and your grandson. Enjoy the holidays! My biggest challenge as a parent is that my son has Asperger's. There are enough books in the world, not enough information, not enough answers. Every child is different. The only way to learn is to let your child teach you how to understand them. My biggest challenge when my Children were young was being a single parent. I just had yo always have the mentality to persevere. My biggest challenge was letting go when my kids were grown, it's hard not to keep worrying about them even when they are adults. I just try to remember when I was their age and let live, now it's getting grandbaby time. My biggest challenge has been trying to get through school while pregnant and now with two little ones. I just graduated and now I have to prepare for a huge exam, which I'm not prepared for and I can't get a job in my field without it. I just don't have time to study because their dad works nights and 12 hour shifts sometimes 6 or 7 days a week. He doesn't have a choice because I got hurt at my last job of 11 years and we literally can't afford our bills now. I'm permanently injured though, so I can't just go get any job, as my restrictions are pretty tight. We are hoping that my parents send their gifts for the kids before Christmas so that they have something besides a few Dollar Tree junk gifts. My heart will hurt. I'm sorry. My biggest challenge has been keeping up with the housework and getting dinner on the table. I overcome this most of the time by running home on lunch to get a quick load of laundry, dishes, or other chores completed. Then when I get home I am not so overwhelmed! I am not yet a parent, our little girl will be baking in the over for about 2.5 more months. But I believe the biggest challenge i will face is to not worry about EVERYTHING and how i will always strive to be the perfect parent. Going into this knowing i cant be perfect already begins the worry lol. My biggest challenge as a new parent is finding time for sleep, eating a meal, going to the rest room and anything else I want to do without a fussy baby. Lol! It's very rewarding though! My biggest challenge was getting my son to eat healthy food. He was very fussy. I just kept trying different food each day until he would taste it. The biggest challenge has keeping up the housework.